This is a Triple Crown Glory Champions Collage 16X20 Photo with Secretariat with Ron Turcotte (1973), Seattle Slew with Jean Cruguet (1977), and Affirmed with Steve Cauthen (1978). The Triple Crown is an unofficial championship attributed to a Thoroughbred horse that in a single season wins the Kentucky Derby, the Preakness Stakes, and the Belmont Stakes. Winning all three of these Thoroughbred horse races is considered the greatest accomplishment of a Thoroughbred racehorse. These are the last 3 Horses/Jockeys that have completed this milestone. 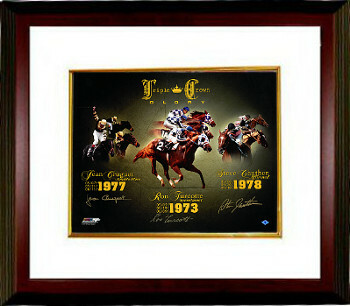 Ron Turcotte, Jean Cruguet, and Steve Cauthen have all 3 signed this 16X20 Photo. Certificate of Authenticity from Athlon Sports Collectibles. Custom White Mat and Premium Mahogany Framed as shown.